Woohoo! I was one of the lucky 250 who received a Do It Yourself Denim Kit from Bershka. So here's "MINE OF 250" - from a classic skinny jeans to a trendy dungarees. I call it "eco-friendly treasure chest!" I received this probably 10 days ago, and I did my DIY denim last week end. The kit includes a pair of denim jeans and the things you'll need to customize it. A few little pieces of fabrics (lace, camouflage, faux leather and denim), paint and paint brush, studs and nailheads, stones and pearls, threads and needles, sand paper and an iron-on sticker sheet. So basically, everything is there! You'll only be needing a pair of scissors and you're ready to D-I-Y! The first thing to do: CUT IT! Then let your creative juices flow and your imagination works! I wanted a playful twist but not a "trashy" looking DIY denims - so I made a short denim dungarees, out of the skinny denim jeans. I cut it into a short shorts and I used the other portion for the "bib" part of the dungarees. To keep it feminine, I cut a floral pattern from the lace fabric included in the kit and neatly hand-sewn it. I love how it appeared like a nice embroidery. I also added some pearls and stones to give some pretty details. 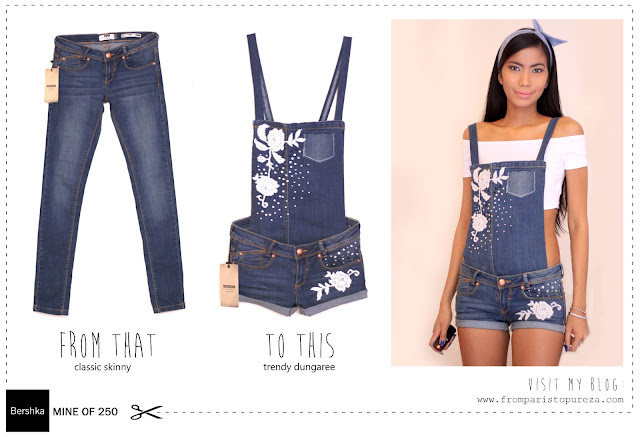 Crop tops look great under a pair of dungarees and they are the biggest trend this summer! I seriously enjoyed doing this... Universe, please take me to that festival in London! Haha!